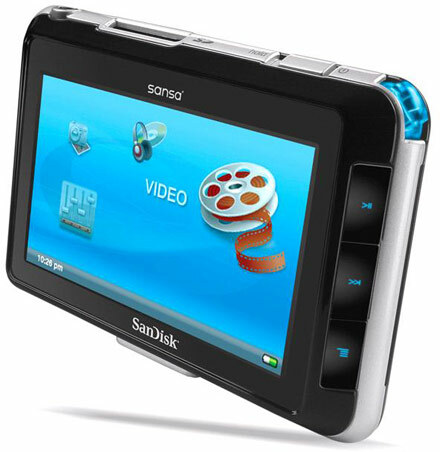 Flash memory maker SanDisk recently introduced its first widescreen portable media player dubbed the “Sansa View”. The flash-based Sansa View is a video and music player. It supports a wide array of content formats and comes equipped with a flash memory expansion slot. The 8.0GB Sansa View is one of the slimmest on the market today at less than 17mm (0.66”) thick and boasts a large 4 inch widescreen display for optimal viewing. It is tiny compared to Apple’s heftiest 80GB iPod. Even though it has only 8GB of memory, but additional memory cards can slotted in for additional memory. The 8G internal flash memory in fact allow you to store up to 33 video hours or 2,000 songs or thousands of photos. The flash memory expansion slot allows for additional memory capacity and playback of content found on SD and SDHC cards, such as Disney Max Clips. The small and durable device, SanDisk Sansa View, works well with recent versions of Windows Media Player, and can download music from various services. It has been designed to work with Windows Vista as well. Sansa View is sturdy and easy to use. It contains a removable Li-Polymer battery that provides up to four hours of continuous video playback and 10 hours of continuous audio playback4. The battery can be replaced by the customer to provide many years of continuous service. A user-replaceable Li-Polymer battery, along with an extended-life battery, will be sold separately. Retailing for $299 MSRP, the 8GB Sansa View is expected to be available from retailers in the U.S. in the first quarter of 2007.